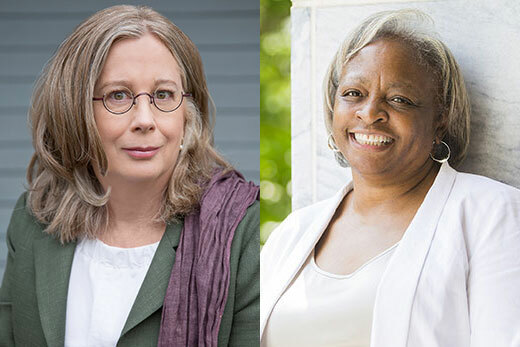 Emory University professors C. Jean Campbell and Carol Anderson have been awarded 2018 Guggenheim Fellowships to support their groundbreaking research. Two Emory University professors have been awarded 2018 Guggenheim Fellowships, the John Simon Guggenheim Memorial Foundation announced Thursday. Carol Anderson, a historian and Charles Howard Candler Professor and Chair of African American Studies, won a fellowship in constitutional studies. C. Jean Campbell, a professor of late medieval and Renaissance art history, won a fellowship in fine arts research. Both scholars are based in Emory College of Arts and Sciences. They are among 175 recipients who were chosen from nearly 3,000 applicants in the United States and Canada. Fellowship amounts vary, but are designed to help fund writers, scholars and scientists in their work. Edward Hirsch, president of the Guggenheim Foundation, described the winners as “the best of the best” in a press release announcing the prestigious awards. “It’s an honor to be able to support these individuals to do the work they were meant to do,” Hirsch says. Anderson’s research has long focused on the making and unraveling of public policy and how racism affects that process Her most recently published book “White Rage,” was a New York Times best-seller and won the 2016 National Book Critics Circle Award in the Criticism category for her examination of policy responses to African-American political and economic advancement. “White Rage” was also recognized as one of the best books of 2016 by the New York Times, the Washington Post, Boston Globe, St. Louis Post-Dispatch, and the Globe and Mail. Anderson’s fourth book, “One Person, No Vote,” chronicles a related issue: the policies designed to rollback African-American and other minorities’ voter participation since a 2013 Supreme Court ruling undermined the Voting Rights Act. That book is due in September. As a scholar whose work has public policy implications, she has served on working groups dealing with race and minority rights at Stanford’s Center for Applied Science and Behavioral Studies, the Aspen Institute, and the United Nations. Anderson will deliver Emory’s 2018 Distinguished Faculty Lecture on “White Rage: The Unspoken Truth of Our Racial Divide” at 4 p.m. Monday, April 9, in the Presentation Room of the Oxford Road Building. Campbell focuses her research on art and poetic culture in early Renaissance Italy. Her works, including two major book publications, range beyond art history and into the study of early Italian literature such as vernacular works by Dante, Boccaccio and Petrarch. Winning the fellowship will allow Campbell to complete a book-length study on imitative practice and pictorial invention in the art of the celebrated Veronese painter Pisanello. She served as the Winship Distinguished Research Professor in the Humanities in Emory College from 2004 to 2007. In 2003-04, she was Kress Senior Fellow at the Center for Advanced Study in the Visual Arts (CASVA) at the National Gallery in Washington, D.C., and served on the CASVA advisory board from 2008-2011. Since its establishment in 1925, the Guggenheim Foundation has granted more than $360 million in Fellowships to over 18,000 individuals, among whom are scores of Nobel laureates, Fields Medalists, poets laureate, members of the various national academies and winners of the Pulitzer Prize, Turing Award, National Book Awards and other internationally recognized honors. The Guggenheim Fellowship program remains a significant source of support for artists, scholars in the humanities and social sciences, and scientific researchers.